Your Nova Scotia tourism vacation brings you to a peninsula, surrounded on three sides by water and Shelburne is located on the southwestern South Shore. This provides us with some of the most scenic coastline vistas in the world. Seaside fishing villages, isolated inlets and beaches a plenty await you, as we are literally "thrust" in to the Atlantic Ocean at the very Eastern tip of mainland Canada. 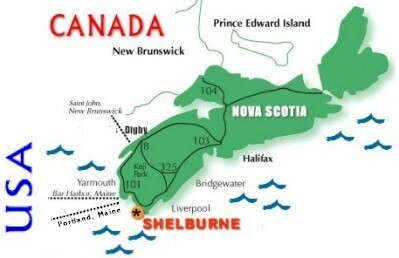 Most Shelburne visitors arrive via a ferry service; from Bar Harbor, Maine to Yarmouth, Nova Scotia, just one hour's drive from Shelburne and also a ferry from Saint John, New Brunswick to Digby, again, a short drive to Shelburne. If you are traveling from Newfoundland, you will enter Nova Scotia in North Sydney via ferries from Port-aux-Basques or Argentia. Reservations are recommended for some of these voyages, see below for details. Highways from all points in the United States and Canada join the Trans Canada Highway in New Brunswick onto Nova Scotia on on to Shelburne. Follow the Trans-Canada Highway, Interstate 95, or a host of routes from the New England States and Quebec through New Brunswick to Nova Scotia. From Prince Edward Island, you can take the Confederation Bridge or the ferry from Wood Islands PEI, to Caribou, NS. Service on THE CAT by Bay Ferries high speed catamaran car ferry. Daily service between mid May - mid Oct. Twice daily during peak season. 2.5 hour crossing.